With the CBCA theme for Children’s Book Week 2017 being “Escape to Everywhere", I’ve been looking for books that suit this theme. Circle is a children's picture book by Jeannie Baker, published by Walker Books (2016.) RRP: $Au 27.99. I am a big Jeannie Baker fan. Who would not be moved by her books, by her confronting themes and her exquisite mixed media collages? I have previously reviewed her books, Mirror, and Belonging. Circle is another masterpiece. I particularly enjoyed the way Baker emphasised the Circle of Life, and showed us so many details of the white patched bar-tailed godwit’s incredible journey. 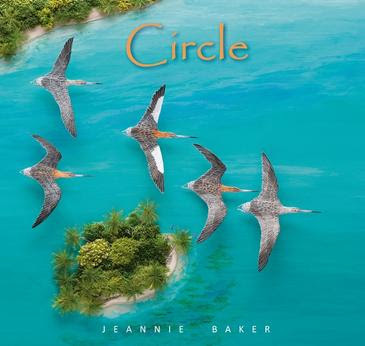 I believe Circle would make an excellent choice to share with kids during Children’s Book Week in August. The beginning illustration is of a young boy lying on a bed next to a wheelchair, wishing he could fly. The final illustration (aside from the end notes) is the same boy imagining himself in flight with some godwits. Kids will understand immediately that Circle is, among other things, about the power of story to set us free and help us escape to anywhere. There’s even an escape scene in the main section of the book, when one godwit chick escapes from a fox. Baker constructed her collages from materials she collected while tracing the godwits’ migratory trek. This attention to visual detail, and the way Baker shows us things from different perspectives, combined with the important theme of the book all contribute to Circle being what I consider a masterpiece. The stunning illustrations and the amazing story of the godwits’ migration will certainly kindle children’s imaginations. And I think that’s what Children’s Book Week is about. There are also resources to support Circle on Walker Books’ website. GIVEAWAY: In conjunction with my review, Walker Books will generously give three copies of Circle to three lucky readers of The Book Chook who live in Australia. To be in the running, you need to send an email to: thebookchook (at) gmail (dot) com and include 1. your full name and your AUSTRALIAN address where the book is to be delivered, and 2. the answer to this question: Name the highly skilled and generous TL who is also a book reviewer, initials BB. A random chicken will choose three book recipients, and their books will be sent from Walker Books Australia. One email only per person, and entries close 5:00 am 27 May, 2017. NB The three winners have now been notified. Find more Children's Book Reviews on The Book Chook by clicking Reviews in the right sidebar. You might also be interested in Ideas for Children's Book Week 2017, and Activities for Kids - Children's Book Week 2017. Susan, I can't believe I haven't seen this book yet. On my way to my library page to check it out. Thanks for sharing! I hope you find it, Cathy. I predict you will love it!